Preparation Methods & Dosage :Edible culinary mushroom, extracts, capsules. 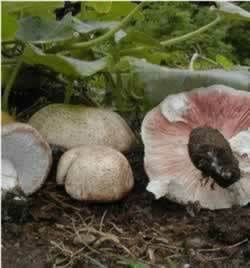 Agaricus subrufescens Peck was cultivated first in the late 1800s in eastern North America. The type consists partly of cultivated material and partly of field-collected specimens. Once a popular market mushroom, the species faded from commerce in the early 20th century. More recently, a mushroom species growing wild in Brazil has been introduced into cultivation in Brazil, Japan and elsewhere. This Brazilian mushroom has been referred to by various names, most commonly as A. blazei Murrill (sensu Heinemann) and most recently as A. brasiliensis Wasser et al. An important concern related to the consumption of wild mushrooms is the possible contamination with high levels of toxic chemicals, such as arsenic, lead, cadmium, and mercury. Three cases of severe liver dysfunction were reported in cancer patients taking ABM extracts. Careful clinical and epidemiological studies are needed to compare the activity of extracts and compounds isolated from ABM, to determine whether ABM extracts provide true clinical benefits. The authors conclude that more data are also needed to elucidate the mechanisms of action responsible for the benefits attributed to ABM before official recommendations are made for its use in the prevention and treatment of cancer and immunodepressive disorders.